We listed Area C's debut release on Last Visible Dog a few lists back (and we're relisting it on this list for those of you who missed out), so we were psyched to discover this amazing hand made quadruple 3" cd-r set, which is limited to FORTY COPIES a bunch of which we managed to get direct from the band himself. That's right, HIMself. This is all the work of one man, but it sure doesn't sound like it, instead, it sounds like the work of some strange rock band, a band concerned more with texture and mood than actual rocking, guitars are looped and smeared, rhythms pulse and lope, a dreamy ambient post rock world of darkness and mystery. Crafted almost entirely from guitars, chopped and looped and processed, these 4 discs are each a puzzle piece, a tiny part of a grander, expansive, rich sonic soundworld. Looped guitars slither and sway, constructing dark melodies and simple propulsive rhythms, almost like a more minimal abstract Tortoise, but beneath THOSE guitars, are still more guitars, weaving elaborate backdrops of sparkling shimmer and barely audible clouds of sound. Elsewhere, tracks explode into super distorted blown out krautrockscapes, others meander lazily, slow moving and strange almost mechanical sounding melodies, over abstract industrial frameworks. But at the heart of it all, is the guitar, and a dreamy moodiness that suffuses every sound on all four discs. And as if the sounds here weren't captivating enough, the packaging is completely gorgeous and deluxe. All hand made and assembled, the four discs are housed in an oversized thick cardboard sleeve, held shut with a Japanese style obi. Inside, each disc comes in its own elaborate sleeve, housed in its own little plastic pouch affixed to the inside of the sleeve. Disc one comes in a sleeve like a folded map, with part of it cut away to reveal the disc inside, the second and third disc are each wrapped in a transparent full color vellum sleeve, alongside a tiny square of actual wood, and the fourth disc is also a vellum sleeve, but printed with an austere winter landscape over a folded square of thick textured paper. So completely amazing. 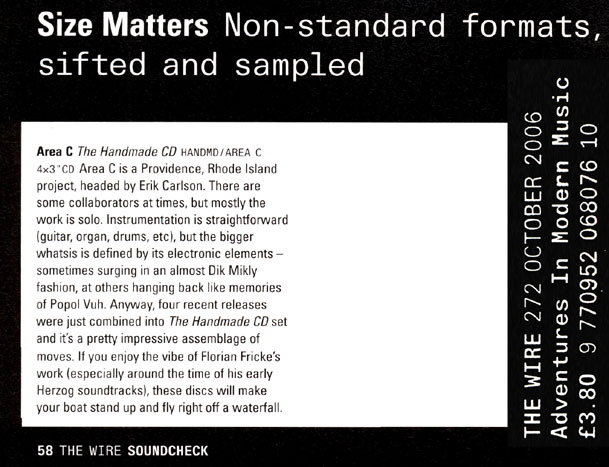 And the Last Visible Dog “complete unknown” factor strikes again with Area C. It took months for me to get this album, called Traffics and Discoveries, into the player. I had about 12 other CDs to listen to from the Dog alone, let alone the 1,112 non-Dog discs beyond that.... But when it finally did make it in, and its pronounced slow-bliss (sober Spacemen 3??) effects started to take hold, I’ll be damned if it didn’t melt all of my stress and worries into small limpid pools of protoplasmic aura that were, perhaps not coincidentally, the very same color as the ambient green that bathes the CD cover. Go figure! If you picked up Last Visible Dog’s recent six-disc “Invisible Pyramid: Elegy Box,” you were treated to a 19-minute exercise in drone poetics, courtesy of Providence, R.I.’s Area C. His track, “Chain Bridge,” led off the final disc of the set and proved that this relatively new voice in the drone scene was definitely worthy to sit alongside the likes of Ben Reynolds, Ashtray Navigations and My Cat is an Alien. As great as Eric Carlson’s contribution was to the compilation, it was just a tease, preparing us for this, his debut full-length. The fact that “Traffics + Discoveries” was crafted primarily with guitar loops and effects pedals does not mean that you know what to expect from it before you even listen. The sounds that Carlson achieves with this palette are definitely not monochrome  a broad spectrum of sound washes over you during the entirety of the album. There is never a dull moment, as each track takes on a separate dynamic realm and the songs themselves change shape, eliciting a stimulating listening experience. Most of the songs are relatively short compared to “Chain Bridge” with the exception of “Dark Radio / Light Waves,” which is actually two pieces joined together. The ‘dark’ half features a sample from A.M. radio over a miasmic drone and gurgle, while the ‘light’ half sends us East with a chant heard at a temple in Taipei. It’s a very delicate track, where the sound is sometimes reduced to a murmur. Area C (lead by Erik Carlson, and joined by a few like-minded collaborators) first came to my attention last year via their excellent contribution to the Last Visible Dog monster compilation “The Invisible Pyramid: Elegy Box.” Even before that public debut they’d been quietly building a reputation in their hometown environs of Providence, Rhode Island for electronic explorations issued as a series of self-released 3” cdrs (most recently released was “Handmade #4”). Traffics + Discoveries is the band’s debut full-length and the varied approach allowed by the longer running time is exploited to the fullest. The smooth surfaces of effect-laden guitar and organ are polished with gritty sandpaper as Carlson’s compositions maintain fragility without brittleness. Their supple curves can roll the listener around in space like a ball as they decay and regenerate in relation to themselves and to silence. After the brief hazy pulse of “daymarks”, the track “sheering out a line” settles in with its looped guitar lines intersecting, overlapping, and entwining over a set of constantly shifting background drones. The lines become fuzzed with warm electronic distortion as they build, subside and regroup. The effect is quite similar to Peter Wright’s less abstract pieces though perhaps more tightly melodic. “in channels” features tight loops oscillating against each other while refracted bursts of staticky guitar penetrate the underwater scene. The guitar clouds in “treble thickness” remind me a bit of the sonic wallpaper This Mortal Coil used to decorate their rooms of sound but Carlson populates his room by alternating a simple descending riff with a quavering high chord on the Farfisa. We look around at each other every day, and I am sure that most of us take for granted the great leap we as a species have made since we departed from our rainforest-dwelling primate cousins. It's almost hard to imagine sometimes the impressive changes that had to have occurred in order that we are here now, driving automobiles, analyzing in detail the history of our Universe, or typing this review into a computer; getting at our baked beans with a can opener rather than cracking nuts open with sharp stones. Our lack of big-picture perspective is no doubt due to how gradual this change actually is, taking place over millions and millions of years. 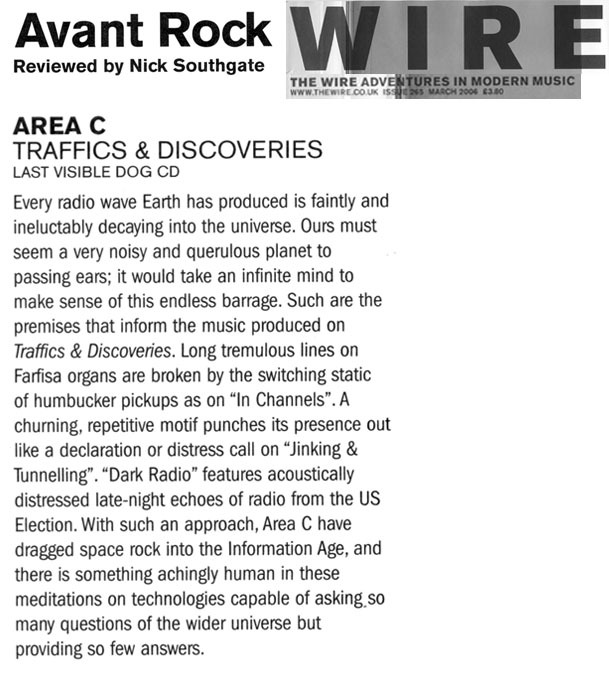 Area C, in their most recent album, Traffics + Discoveries, seem to show an appreciation for this idea that things need not evolve quickly -- that sometimes, it just isn't natural. Indeed, their "songs" do feel like snapshots of a larger piece. Most of the passages here come to an end without sounding too different from their beginnings. There aren't slow crescendos, or glorious, melodramatic climaxes to be found here, but that's not to say that these minimally designed pieces are completely static, repeating the same thing over and over. The slowest of creatures do move and breathe, and seemingly silent and immobile flowers open up to take in the sunlight. Likewise, although there are no big changes, there is a sense of progression to these compositions. Guitars, synthesizers, samples, and sounds explore the space around them, and with each other, but not aimlessly. And subtle as they may be, there are melodies to be found here, too. ...this one-man band creates warm, interesting and exquisite drones and loops by using mainly guitar and numerous pedals.... I’ve noticed that I listen to it just as eagerly on MD when I’m walking outside as I do on my home stereo. I must say that I really like this. Absolutely one of the best LVD releases I’ve heard. ...this one-man band creates warm, interesting and exquisite drones and loops by using mainly guitar and numerous pedals.... IAnother one we first heard on that massive Invisible Pyramid: Elegy box set that Last Visible Dog put out a few months ago (Mudboy was the other Providence, RI drone artist that we discovered via the IP box). And now, like Mudboy, Area C has their own cd release on LVD. Actually a one-man guitar loops and effects (and other things besides, like farfisa organ) effort, Traffics + Discoveries starts out very blissful and calm, ambient like Eno perhaps...and as the disc goes along it stays quite beautiful but gets edgier and darker and more nervous-making. We like it quite a bit. Chalk another one up for both Providence and LVD, in the everybody-wins competition for who's got the best drones around!